James, you asked about the great grasshopper invasion of San Luis County. My mom took this photograph on the ranch. It’s Lester Falk holding a prize hopper, the one that didn’t get away. It was very difficult to hit them because they were jumped all over the place and you had to be very good at making a moving shot. You can see he used a 30-30, as a twenty two slug couldn’t do the job; the small slug couldn’t penetrate the exoskeleton of the grasshopper. Exoskeleton, Lester would have laughed himself silly over that word. You see, he never went to school, at least not enough to read and write and words were like a foreign country to him. A very distant foreign country to boot. His family was “Tractored Out” of Oklahoma in the thirties. 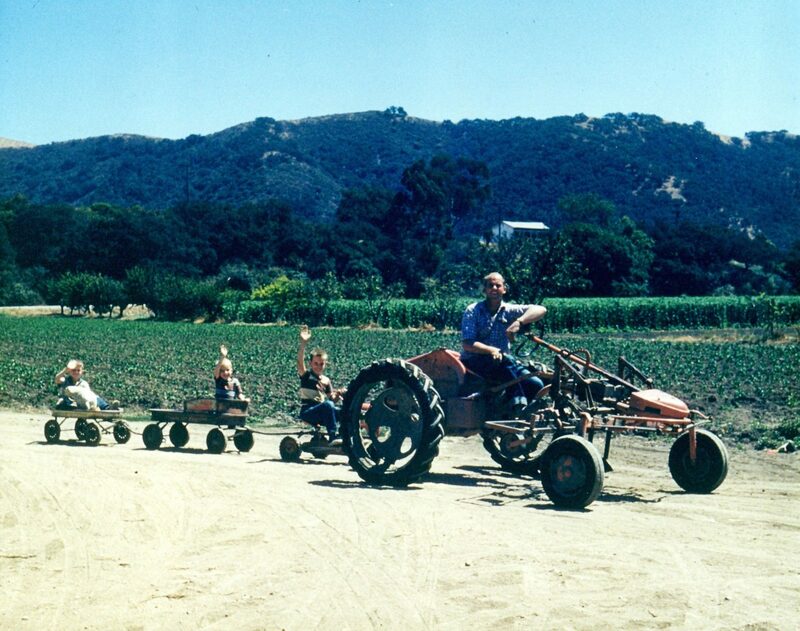 They came out to California in ’37, everything they had on the back of a Model T flatbed truck, Grandma, husband, wife and three boys, Frank and the twins, Lester and Chester mixed in with the chairs, mattresses, and the detritus of a failed life. They were considered “no account” in Oklahoma and maybe worse in California. One of thousands of defeated families who would be the models for the Joads. They were proud though, pride was all they had and they new the meaning of work. It was the only currency they had. That’s all my dad cared about; the work. People have forgotten that everyone was part of the depression. They were all in it up to their necks, particularly the farmers. My dad was no exception. He saw Lester, Lek as he was called, hanging around the Greyhound bus depot on Branch St in the summer of 1939. He was standing there, didn’t have a crown in his hat, broken down old shoes, pasteboard in the soles, his old shirt was torn. Dad needed hands that day and he asked him, “Done any farm work?” He said “Yeah, I have.” Dad asked, “could he drive a truck?” Lester said, “Well, I drove a truck over thar in Maricopa, in them oil fields.” “Well, you want to try and go out and help me?” He said he would. “Had any breakfast? “No” he said, “ain’t had no supper neither.” Dad took him over to Mutt’s cafe and told them to fix him up with breakfast and a lunch. He said that he had some overalls and maybe some old shoes he could wear and put him in the truck and took him out to the ranch. In a week he were showing the others a new way to go. I can understand that. I’m smart enough but I was always pretty indifferent in school, noodled my way through with the help of my mothers teacher friends Frankie Campbell, Gladys Loomis and Ruth Teague. Not to forget Helen Otsugi either. But I can turn a wrench, and I can see every part of a house and how they go together without even closing my eyes. The stories about Lester always made sense to me. Even as a boy, I was always making something, a fort, a boat to put in Arroyo creek and dozens of projects that only farm boys can do. So Lester worked for my dad for five years until ’42. He was just 21 when they called him up and sent him off. Remember, he was smart and when he told them he couldn’t read or write, he figured they’d just let him go. They didn’t though, they put him in school. He still figured they’d let him go if he wouldn’t learn; but they didn’t. They said, “riflemen don’t need to read and we know you can shoot.” Lester still thought he could figure a way out. He survived the battles for Sicily. They told my dad that he tried eating soap on the way to the landings at Anzio. He just knew he could find a way home. But he didn’t. They killed him in Normandy. Lester was just eighteen when the picture was taken. My dad had the grasshopper stuffed then, and for many years it would turn up as a gag gift at house warming parties around Arroyo Grande. Kenny Talley and I used to play with it when his folks lived on McKinley Street. I think Oliver and Hazel gave it to John and Nancy Loomis when they moved out to the house on the Tar Springs ranch. I last saw it on a shelf in Chris’s Saloon. Don’t know where it is now. That is my uncle Robert Hall, working on the Miramonte ranch east of Clovis Ca. He is 17 and the year is 1936. The horse is Doc and the dog, Bobby Dog. He was going to Sierra HS and living with his sister and husband while his parents followed the California oil fields.